Welcome To Your Senses: Undo This ! I cant believe this is real. 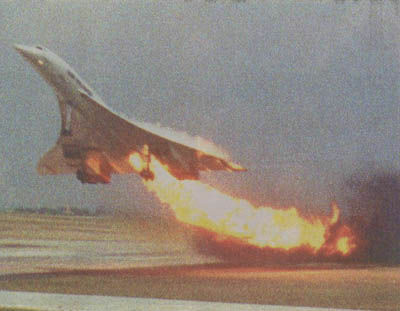 This is a photo taken from the "Air France Concorde crash 25th July 2000". This event and many others brought a dead-end to the concorde flights from operation. Here's how the last British Airways Concorde ended its flight. It was escorted by Mini's and what a Glory. I used to think, I should make enough money and Fly on a British Airways Concorde, like how many of us thought about the Twin Towers. More and More Concorde pictures here. Saare, thanks for those Concorde links. :) Have you "sighted" Concordes on Google Earth? Fav. pass time of mine. Yeah, Its a superb picture.!! Concorde is a sight to watch. I've seen people line up with cameras.!! to take a picture of the CONCORDE. As an NRI living in US...and waiting for the day when I can go home in a few hours instead of the atleast 15 hours.!! I pray the airline industry comes up with a superfast JET.